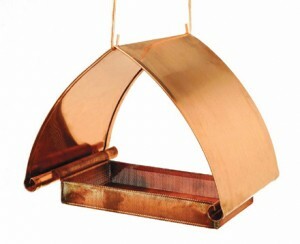 Here’s a new twist on an old favorite, the Mod Pod bird feeder produced a few years ago by Birdbrain. The bright colors and groovy designs really caught folks’ attention (and birds too), so it was a real bummer when they discontinued the line of feeders. Enter this oval glass bird feeder that’s actually frost resistant ceramic. The improved design is an added bonus because it accommodates a variety of treats for your beaked buddies! Sort of like a Fly-Thru feeder, you can offer birdseed mixes, peanuts, fruit, suet, and crumbles & nuggets in this fun glass bird feeder. Change up the menu according to seasons – and who you’d like to attract. The open design also makes filling and cleaning a snap. 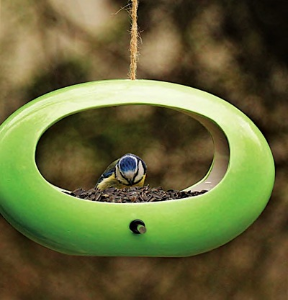 Shown in light lime, the Mod Oval Bird Feeder comes in cool Winter Blue as well. A high quality glass bird feeder that promises many seasons of use and enjoyment by birds and hosts too! From Fly-Thrus, to Platforms, you can entice more species of birds by offering a variety of treats. 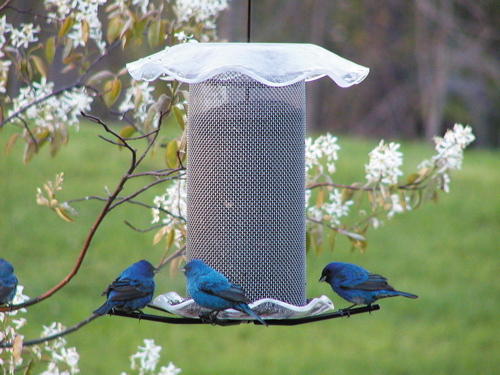 These styles of feeders allow you to change up foods according to season, offering migratory birds in summer a completely different menu from local winter residents. 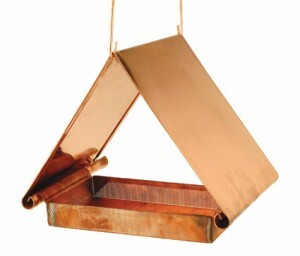 Anything from fruit and suet, to peanuts and mealworms, are easily fed in this style feeder. All birdfeeders are not created equal: Some desirable birds will not visit certain types of wild bird feeders, like tube style feeders. Great for some clinging birds, they’re just not suited for all birds. But most are easily drawn to platform and fly-thru feeders. Cardinals are a good example of this, as they tend to shy away from the narrow perches on tube feeders. There are still many delightful options when choosing a platform-type bird feeder, they need not be boring! From classic architectural styles, to whimsical and fun designs, wild bird feeders will enhance any garden or yard while attracting feathered friends, they bring a dull and boring area to life!